Washington, D.C. - U.S. Sens. Jeff Flake (R-Ariz.), Claire McCaskill (D-Mo. ), Pat Toomey (R-Pa.), John McCain (R-Ariz.), Mike Lee (R-Utah), Rob Portman (R-Ohio), Ron Johnson (R-Wis.), Marco Rubio (R-Fla.), Joni Ernst (R-Iowa), and Deb Fischer (R-Neb.) today introduced a bill to make permanent the temporary moratorium on congressional earmarks, which has been in effect since 2010. The Earmark Elimination Act would create a point of order against any provision contained within a bill that matches the definition of an earmark. An earmark is defined as any congressionally directed spending item, tax benefit, or tariff benefit targeted to a specific recipient or group of beneficiaries. This point of order would only apply to the earmark, not the entire bill. If the point of order is raised, the earmark would be stricken unless a two-thirds vote of the Senate waived the earmark point of order. "For years, earmarks fueled overspending in Washington and undermined the integrity of our legislative process. We cannot afford to allow Congress to ever resume this practice and play pork-barrel politics with taxpayer dollars," said Toomey. "Now is the time to get rid of earmarking for good." "It's time to stick a fork in congressional pork with a permanent ban on earmarking," said Flake. "Republicans were beaten like a borrowed mule in the 2006 elections largely because of the corruption associated with earmarks. Let's not test the voters again by leaving the door open for a return to the pork barrel politics that sent members of Congress to prison and saddled taxpayers with a bridge to nowhere, a teapot museum, and countless other wasteful pet projects." "Earmarks are the Washington swamp creature that just never seems to die-emerging from the lower depths every few years in an effort to waste taxpayer dollars on politicians' pet projects," said McCaskill. "Our bipartisan bill would ban their return by permanently ending the practice of pork-barrel patronage so we can ensure Missourians' taxpayer dollars are protected from waste, and projects are prioritized on merit." "The practice of congressional earmarks breeds corruption, leads to egregious overspending, and places the needs of special interests before those of the American people. Lifting the current moratorium on earmarks would only accelerate the erosion of public trust in Congress and send taxpayer dollars to unnecessary pork-barrel projects," said McCain. For decades, I have fought the often lonely battle against earmarks, and I'm proud to join my colleagues today to introduce legislation that would make permanent the ban on this corrupting practice." "Earmarks probably would make it easier for party leaders to pass some bills. But increasing the power of an already untrusted and unpopular party elite is not what Americans want or need," said Lee. "Earmarks can't bring back the trust Congress has squandered. Only transparency and accountability can do that." "Instead of debating whether earmarks should be revived, Congress should be pushing to ban earmarks permanently," said Portman. "At a time of record debt, it is more important than ever to eliminate unnecessary pet projects and wasteful spending. I am happy to join Senator Flake on this important legislation." "Our nation is currently more than $20 trillion in debt and faces projected deficits totaling at least $100 trillion over the next 30 years. Earmarks only exacerbate this problem and further mortgage our children's future by funding unnecessary insider pet projects," said Johnson. "Members of both parties have wisely abstained from this wasteful spending since 2011, and this bill would ensure it doesn't return." "We should remember why we stopped doing earmarks in the first place: their abuse eroded the public's faith in Washington and helped foster a culture of mindless and wasteful spending. Bringing them back will not make Washington work again. Only elected officials faithful to the American people and Constitution can do that," said Rubio. "I applaud my Senate colleagues for working in a bipartisan fashion to propose legislation to strengthen the current earmark moratorium, on the principle that spending decisions should be merit-based and made in the public eye." "Earmarks cannot and should not be part of our legislative process - period," said Ernst. "I was sent to Washington to cut wasteful spending and protect taxpayer dollars. This legislation prohibits Congress from reverting back to its reckless behavior and slipping special interest spending into legislation. I am glad to join my colleagues in this bipartisan effort to permanently ban earmarks, promote transparency, and better safeguard taxpayer dollars." "I share the belief of Nebraskans that Washington must bring spending under control. A return of earmarks in the legislative process would be a step backwards in our work toward this effort," said Fischer. "That's why I'm proud to help introduce this bipartisan bill to ensure Nebraskans' hard-earned money is used responsibly and wisely." To view a full-text PDF of the bill, click here. 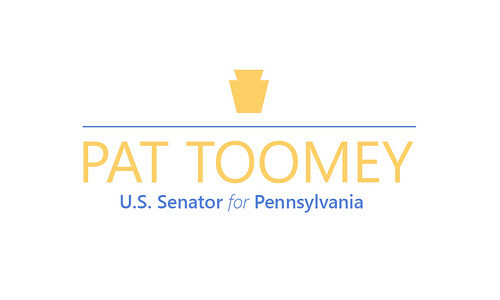 Join our newsletter to stay updated on how Sen. Toomey is working for you. Place your cursor over an area of the map to view its local office information. Please call for an appointment before visiting our Johnstown office.